SPX futures are bouncing along just under yesterday’s closing price. The structure of the decline (circled) is fractally similar to the initial decline from the 2801.90 peak. Wave [a] of 1 of (3) is approximately double the size of Wave [a] of 1 of (1). 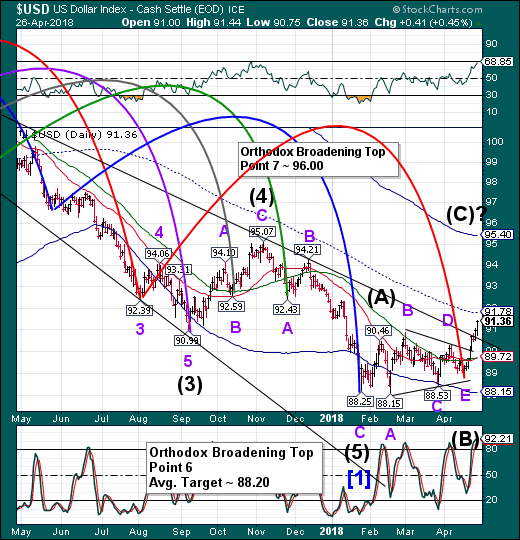 Should it maintain a similar dimension, Wave [c] should break the lower trendline of the Broadening Wedge. Remember, fractals are self-similar and repetitive. The Elliott rule of alternation offers enough variation within each structure to appear different from the last. Wolf Richter writes, “That would be a first, but it might be happening. Everything in slow motion, even market declines? There is nothing like a good shot of leverage to fire up the stock market. How much leverage is out there is actually a mystery, given that there are various forms of stock-market leverage that are not tracked, including leverage at the institutional level and “securities backed loans” offered by brokers to their clients (here’s an example of how these SBLs can blow up). NDX futures soared 87 points right after the close yesterday on Amazon earnings and appear to be maintaining its elevation above the 50-day Moving Average at 6752.04 and near its prior high at 6856.96. That level happens to be a precise 61.8% Fib retracement of its decline from 7186.09. 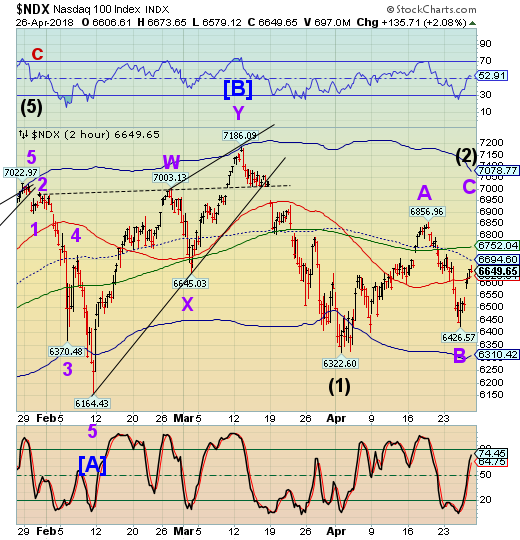 This may result in a probable flat Wave (2) should the rally stop at or near 6856.96. ZeroHedge notes, “In the aftermath of blockbuster earnings from Amazon, which is set to open at an all time high as it breathes down Apple's neck for the title of first $1 trillion market cap company, and Intel, it is hardly a surprise that Nasdaq futures are pointing sharply higher (especially with Gartman shorting the Nasdaq yesterday). 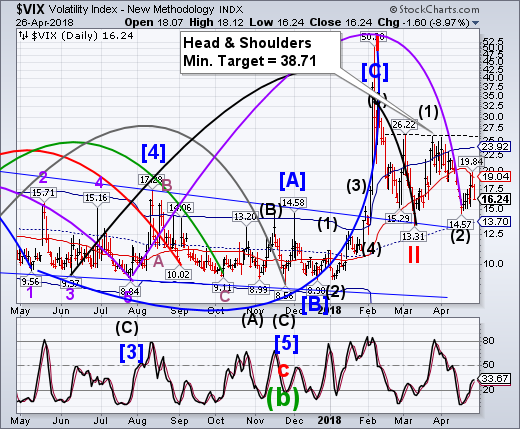 VIX futures are flat this morning with a positive tilt. 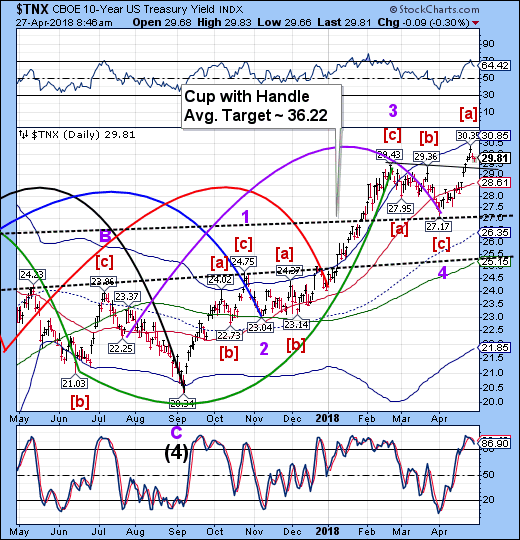 TNX appears to be consolidating after a pullback from its high. The Cycles Model suggests a probable further pullback into mid-week before resuming its rally. The rise of U.S. 10-yields above 3% may be the talk of the town this week, but that doesn’t mean yield-curve flattening is finished. U.S. economic data due Friday may bring it right back to center-stage. Surging commodity prices helped drive the 10-year rate’s ascent, but there are also other supports for higher yields. USD futures appear to be challenging the mid-Cycle resistance at 91.78 this morning. 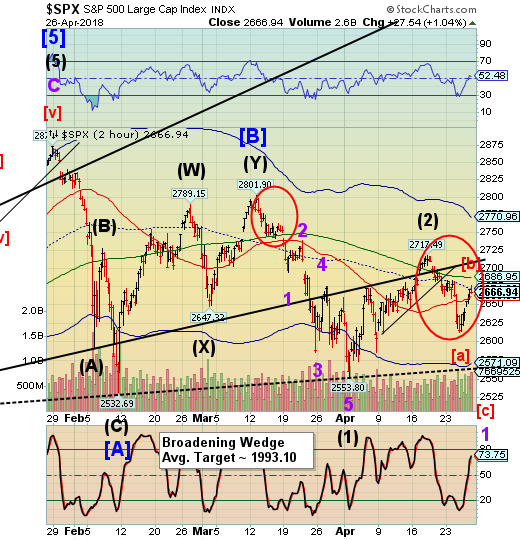 We may see a brief pullback to the trendline here prior to resuming its rally. The Cycles Model shows renewed strength through mid-May after the consolidation.